My perfect day in Barcelona starts early. It’s a sunny Saturday morning around 7.30 at the end of May. The alarm goes off, even though I would love to stay in bed, I don’t think twice! The Mediterranean Sea and the deserted beaches are calling. I’ll get my clothes on and out the door in no time. Walking my quiet street towards the Ciutadella Park. 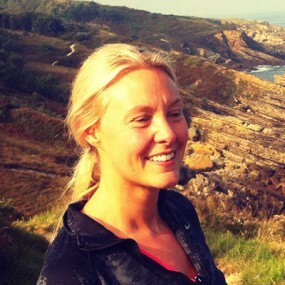 Here I meet the joggers and dog owners, for a split second we enjoy the silent city together. I turn on to Carrer Wellington, then a left on Av. Icària and then a right on to Carrer Ramon Trias Fargas. Then it’s just straight down and I can smell the sea. As I arrive, I stop for a second, take a deep breath and I start to walk towards the neighbourhood Barceloneta. Half way to the W hotel, I meet the lady that always has her make up perfectly done at this hour, doesn’t matter if it’s Monday or Saturday. Further on I meet the old man jogging a long the beachfront, always with the greatest smile on his face. On the beach in front of the gym Club Natació Atlètic-Barceloneta, the old ladies and gentlemen are preparing for their morning swim. As I get to the far end of the beach by the W hotel, I touch the concrete wall, always. From there I start my walk back to the city centre and I meet more and more people, Barcelona is slowly waking up. When I arrive home I’ll have a quick shower and head out again, this time with my shopping trolley in tow. I love doing my grocery shopping early Saturday mornings, something I have always enjoyed during my years in Barcelona. 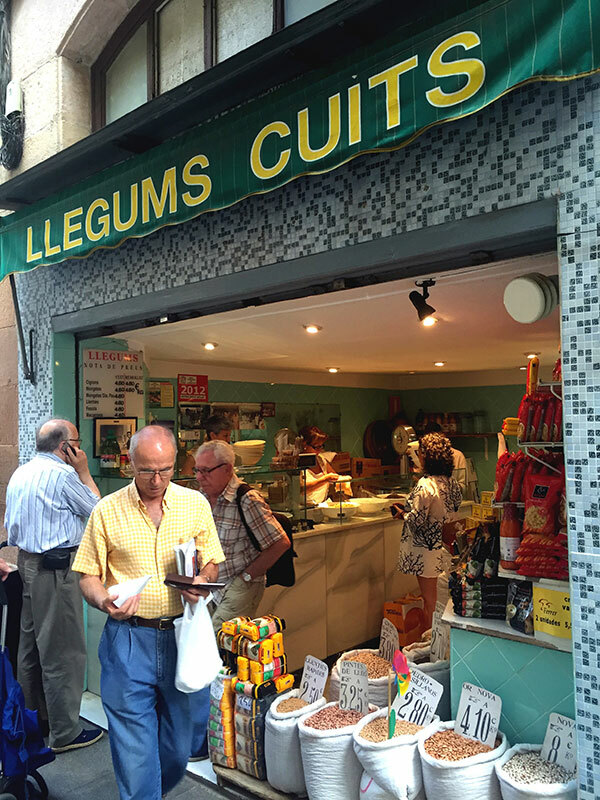 I head to the legume shop on the Carrer del General Alvarez de Castro to buy their heavenly legumes. Here it’s best to arrive early, I’m not the only one looking for these savoury freshly cooked chickpeas, lentils and beans. This must be the best place in town to buy legumes! From here my next stop is the bar La Torna, that’s located in the building of the food market Santa Caterina. I take a seat by the bar and order a black coffee, natural orange juice and sandwich with Iberian ham. While I’m having my tasty breakfast I enjoy watching the people around me. From here I’ll walk in to the market, moving in the direction of the fishmongers, passing all the beautifully decorated stalls. 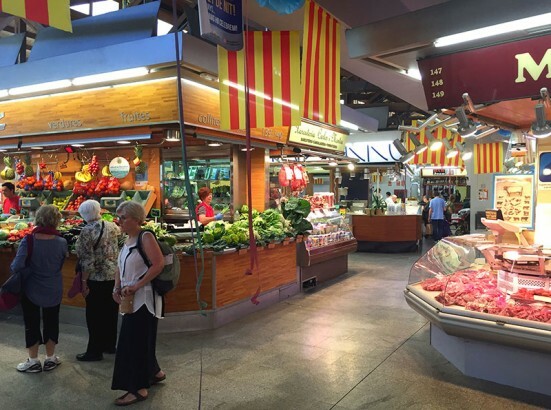 Between the fresh clams, tuna, turbot, red prawns from Palamos I can hardly decide what to buy, the wide selection of seafood that the different stalls displays is amazing. As I like eating as much organically produced products as possible, I head to one of the organic supermarkets in the neighbourhood to buy the last thing needed for the week to come. Once home with all the groceries, its time to head down to the Base Nàutica at the Mar Bella beach to get some paddle surf practice done with friends. The closeness to the sea makes Barcelona a unique cosmopolitan city in the Mediterranean region. Once in the water and on the board my body fills up with a calm relaxing feeling, losing track of time as we are paddling and enjoying the good weather. When we get tired we just sit relaxed on the board watching the beautiful city we all fell in love with the moment we arrived. Seeing Barcelona from this perspective is a different experience that I think everyone should try. 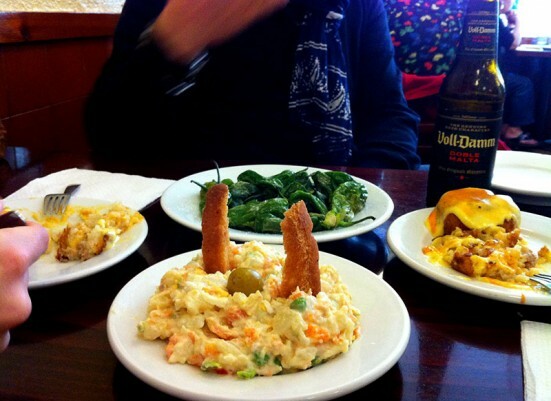 Once we get tired and hungry we decide to head to Barceloneta and bar La Bombeta on Carrer de la Maquinista. Coming from the quietness and straight in to the noise of the crowded bar, we get a table and we order some tapas to share between us. Of course we need to have their specialty, the round balls of mashed potato with hot sauce that’s called Bomba and their excellent cold salad with a base of vegetables and tuna all mixed up with mayonnaise, called Ensaladilla Rusa and we wash it down with an ice-cold Estrella. In this place they make it clear, with big white letters above the bar: We don’t speak English but we do awesome Bombas! But don’t be sacred off, pointing is an international language. Later they also added the phrase: We don’t have wifi, speak to each other..! So don’t bother asking for the password to the wifi. After this start to the day, its time to go home for a shower and a well deserved siesta. Once up, ready and filled with energy it’s time to start thinking about dinner, as I love trying new places to dine, I’m lucky Barcelona has a great offer of different cuisines. Tonight we are lucky people as we have a reservation at the great Japanese restaurant Shunka in the Gothic Quarter (c/ Sagristans, 5). But as we realise we have some extra time before our reservation, we decide to have a glass of rosé at En Aparté. 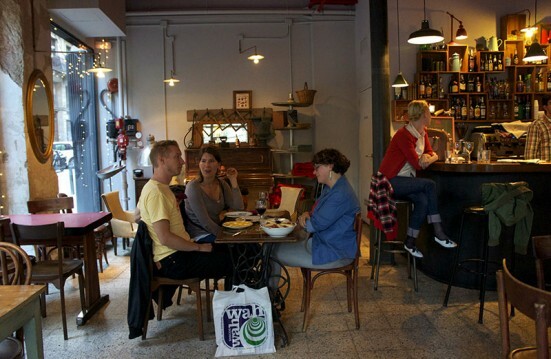 This is a charming French café on the street Lluís el Piadós in the Born district, its situated on a corner with big shop windows to the street and with a terrace to enjoy. The rosé they served is well chilled, perfect for the warmer summer nights that are coming upon us! By the time we finish our drinks it’s time to head towards Restaurante Shunka on Carrer dels Sagristans. The Japanese tavern is medium size and always fully booked. Once you’ve tried their food you’ll know why! In my humble opinion, they serve the best Japanese food in town, they use fresh top quality ingredients and the service is great, I have never left disappointed. 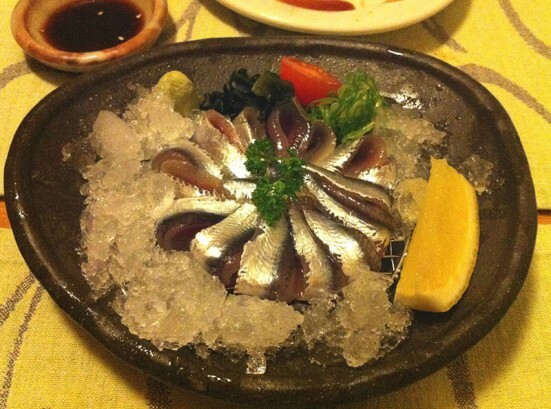 Here we try a great variety of dishes, such as the squid Tako Kimuchi, tuna Toro Tataki Nigiri and Sashimi Iwashi, their outstanding tuna tartare Maguro Tarutaru, all of these delicious plates we accompany with a cold Japanese beer Asahi. We finish our flawless dinner with a sweet green tea Mochi. We leave the restaurant with big smiles on our faces, because what more could one ask for after a perfect day? Walking back though the streets and squares that are buzzing with life in our favourite city that we chose to be our new home – Barcelona we love you! Sara arrived in Barcelona with a friend back in 2000 to travel the world… it never happened, 15 years later she’s still here. You can read about Sara’s foodie exploits on her blog, Appetite & Other Stories or follow her on Instagram and Twitter. Hello, I stumbled across a post of yours on Facebook and would like to follow you, but when I followed the link to Instagram, it was empty? In any event, I’d like to sign up for your posts. I’ve lived in BCN 5 years. I don’t love it, and I’m looking for ways to learn to appreciate the city better.